i understood why this hydrangea was placed there. At first glance, i thought there was nothing left to take note of. Then i looked a little harder…out of all the flowers i took that day, this one is my favorite. it is a peaceful color, with stunning detail on the back…then to set against a gunmetal grey? Perfection. Amy, you have such a talent for taking anything and making it look good. The colors together=pure heaven! 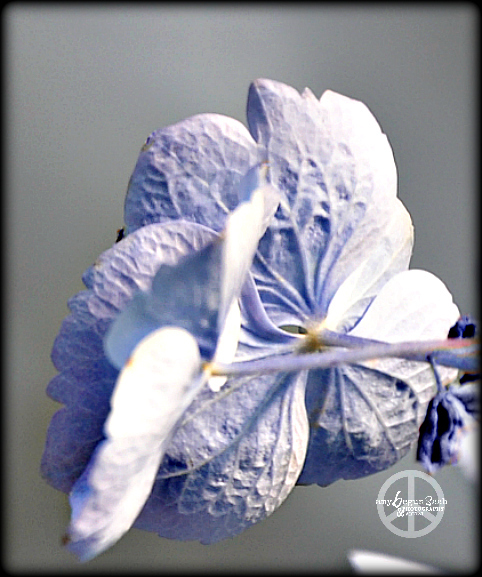 A different perspective – just gorgeous and the color is ethereal.